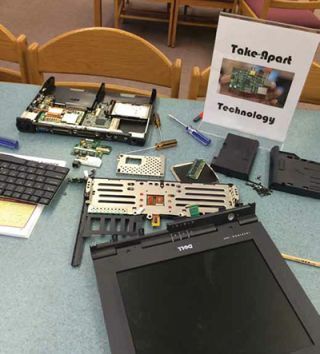 Take-Apart Technology station in the New Milford High School Makerspace. Early in my career as a classroom teacher, I remember building a reading tree house and an outdoor classroom with large rocks as seats. Now in this digital age, I believe that the whole world can be our platform. We should seek to leverage the power of multiple platforms, across the physical and virtual spheres to reach and engage all learners. This kind of thinking has carried through to my position as library media specialist at New Milford High School (NMHS) in New Milford, NJ. When I was faced with the task of making an outdated, drab, and unused library relevant, I had to get creative. My long-term goal was to help the school improve student performance by working to create an exciting and engaging learning environment for all. Inspired by the work of Pixar Animation Studios, my goal was to turn my library into what they have dubbed, a “constant learning organization.” I was further inspired by the t-shirt company, ‘Threadless,’ who “puts everyone in charge” and defines company as community. Much like Threadless’ customers, the students and staff at NMHS are interested and passionate about what they do, and are bursting with ideas, skills, and knowledge. I also discovered that they were keen to become part of the solution for our new library. I wanted the learning space in our library to reflect the reality of our learners by allowing them to contribute to creating a dynamic community. My goal was for them to feel empowered and learn with and from each other. A snapshot of some of the virtual learning spaces of New Milford High School. It was with all of these things in mind that I embarked on two major initiatives. The first was the creation of a “Makerspace” in the library. In creating this informal learning space, I spent the first few weeks of the school year watching the usage patterns of the first few students who came into the library, speaking to them about their interests, and even peering over their shoulders as they used their devices to ensure I had a firm grasp on what they would want in their Makerspace. At the same time, I looked carefully at the existing curriculum and programs that the school was offering. It was at that point that I developed themes for our Makerspace. I ordered materials to support the themes I came up with and then went to work on designing the space. To set up the physical space, I used my school’s existing resources, including old library tables and bookshelves. Architecting the space and sharing my plans with the school community was a collective effort. Soon after, I was able to receive great input from the school’s tech team, observe the skills of the custodians, and engage with an enthusiastic bunch of students who were interested in ‘making’ experiences. It was exciting to witness how eager they were to see a place like this in their school and make valuable contributions to its creation. From this Makerspace, our library has now become a vibrant, relevant part of the school community that offers opportunities for all students to tinker, make, play, innovate, create, and learn. Clockwise from upper left: The littleBits bar in the New Milford High School Makerspace. ; Students assembling eco-friendly robots in the Makerspace at New Milford High School; Students using a Makey-Makey kit to turn pieces of fruit into a video game controller in the Makerspace at New Milford High School. My second major initiative was creating a virtual campus for NMHS. I formed a partnership with a company called ProtonMedia that provides an enterprise solution called ProtoSphere. This technology solution allows users to explore the possibilities of an avatar-based, 3D, virtual learning and collaboration platform. Thanks to this exciting and stimulating virtual learning environment, our classes, lessons, and activities were no longer constrained by the physical classroom or the school timetable. The virtual space helped to redefine learning at NMHS in ways that we could never have imagined, even just a few years ago. Both our Makerspace and our virtual campus brought to fruition my vision of making my library a constant learning organization. Our school now has two robust, student-centered spaces that are both physical and virtual. Students and teachers have access to various technologies and digital and print resources. These learning spaces are productive and offer boundless possibilities for collaboration and creativity. Laura Fleming is the library media specialist at New Milford High School (NMHS) in New Milford, NJ. At the James I. O’Neill High School Library in the Highland Falls/Ft. Montgomery CSD in New York, we reinvented our library into a 21stcentury learning commons. Here’s how. Changing the Rules: There have always been many rules in the library that prohibited the formation of a true learning commons where the students wanted to be. Therefore, we made the switch from “No” to “Yes”—we now allowed students to eat, drink, use their cell phones, play computerized games, watch YouTube—and yes even talk—in the new library commons. Changing the Physical Space: A three-year renovation plan was created. First on our list was tackling the books. After weeding our list, we still needed to accommodate 10,000+ books, and we did not want to use valuable floor space for bookshelves. This was solved by relocating the free-standing stacks and mounting them to the empty wall space. Next on the list was repurposing the open floor into learning spaces to accommodate multiple classes occurring simultaneously, while allowing the space to remain as open and flexible as possible. We subdivided the 60 x 60 space into five areas— a computer lab setting for 32 students with an interactive whiteboard, an Internet browsing area with 18 work stations, a moveable lounge for 24 students (this area also doubles as an informal classroom setting), and two moveable classroom collaboration areas for another 50 students. Adjacent to the learning commons is a media lab/maker space for classes on Web page creation, design and drawing for production, computer animation, 3-D design (complete with a 3-D printer), and electronic music production. In addition, we built a video production studio including a chromakey green-screen wall for student and faculty use. The video club has taken the lead in using this space to collaborate with classes to produce read-alouds of poetry and reader’s theater. Changing the Virtual Space: Changing the virtual space came naturally as a result of an online public access catalog and the district-wide adoption of Google Apps for Education. We equipped two charging carts with Chromebooks for use in the classroom and also for students to borrow while in the library. In addition, the 11th- and 12th-grade students received a Nexus 7 as a part of a 1:1 initiative. Teachers are using their Web pages and GAFE to make assignments and learning resources available for student and parent access 24/7. This transformation has opened the door for students to be active participants in this process as they define the learning spaces that empower them to succeed. Andrea Tejedor, Ed.D., Director of Innovation & Instructional Technology, and Sheri McNair, Library Media Specialist, work at the Highland Falls-Fort Montgomery School District in New York.